This is the second most popular template chosen by our users. It is a simple, yet elegant design that aligns the information to the left except for the top contact information, which is centered. All the fonts on the entire page are the same size except for the section headings they are all caps with bold lettering. The name and contact information are at the top of the page and centered with a horizontal line below it. Each section is spaced apart to neatly organize the details of each section, the headings being all caps aids in separating the sections for greater organization of your data. The names of the companies and the schools are bold to make them more noticeable than the supporting text. The company names and school names have their cities and states directly below them with the attributes of each display in a list with bullet points as is customary. Having the details presented in this fashion tends to spread them out making this popular template a good choice when the applicant is short on jobs or education. Having everything placed in lines traveling down the page in succession can make what is written more substantial than what is actually there. It can't make something out of nothing, but this template can help to cure a sparse looking document. Not everyone has a stellar career so the white space and orientation of each element could help with this problem. This is also ideal for newbies or long-term workers with minimal work experience. The same applies to someone with limited education. The sections can be arranged to optimize the focus of the data to help "cover up" deficient aspects of an applicant's career. 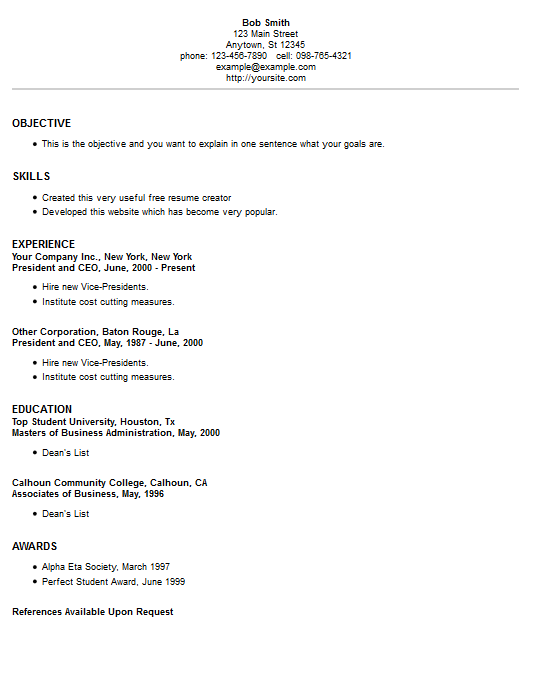 Try our free resume creator to access this template. After you finish, you can make as many cover letters and reference pages as you like. Learn how to write these documents in our career tips library.